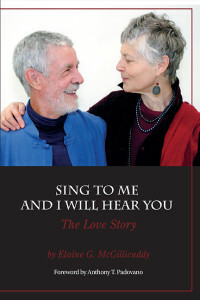 SING TO ME AND I WILL HEAR YOU – A Love Story opens when a nun and a priest, each newly assigned to the same parish school in Waterville, Maine, in September, 1968, are introduced to one another. Sister Maureen, also a campus minister at Colby College during those heady days of anti-Vietnam-war fervor, discovers she has fallen in love with Father McGillicuddy, and, after deep soul searching, leaves the convent. Reclaiming her original name, Elaine takes the reader into her confidence by sharing the story of her two-year “underground” relationship with Father Francis. Together they follow the optional celibacy debates in Rome, await with some doubt, but yet with some hope, a Vatican decision in its favor. Such an outcome would have allowed Father Francis to become a married Catholic priest. But when that door is shut in December, 1971, Francis’ “exodus” ensues and the wedding date is set. Elaine and Francis’ married life is multi-faceted and spiritually rich. After an attempt to adopt a child falls through, they put their energies into peacemaking, founding a yoga center, transforming their lot into a demonstration site for permaculture, and, on Elaine’s part, training for and leading Dances of Universal Peace. Their life together comes to a climax when in 2009, Francis’ cancer diagnosis leaves them only one hundred more days together. Deeply moved by the way Francis approached his own death, she celebrates his extraordinary patience, courage, and grace in dealing with pain and in facing the unknown. Francis does not directly use the expression of his namesake, Francis of Assisi, namely, “Welcome Sister Death,” but he goes out to meet her with the same attitude. And with love on his lips. 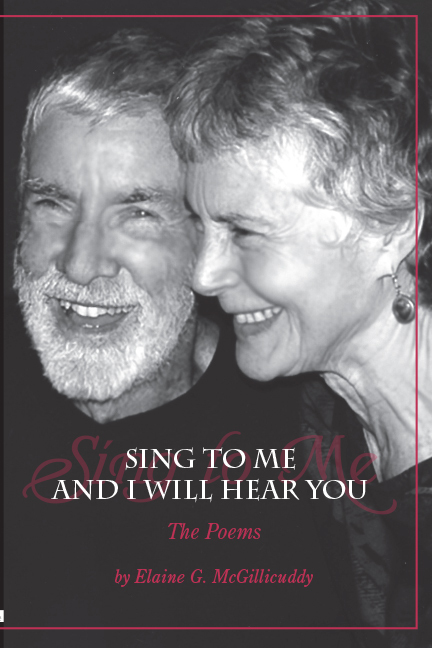 There is indeed a reason for the familiar ring in Elaine G. McGillicuddy’s third book title, SING TO ME AND I WILL HEAR YOU – New Poems: it marks the completion of the author’s trilogy. Amazed over her husband’s remarkable request of her when he would die – she chose his words for the primary title of all three books and for a CD of her reading “The Poems” of the first book (published, 2012). The second book, in prose, is a memoir: SING TO ME AND I WILL HEAR YOU – A Love Story (published, 2014). 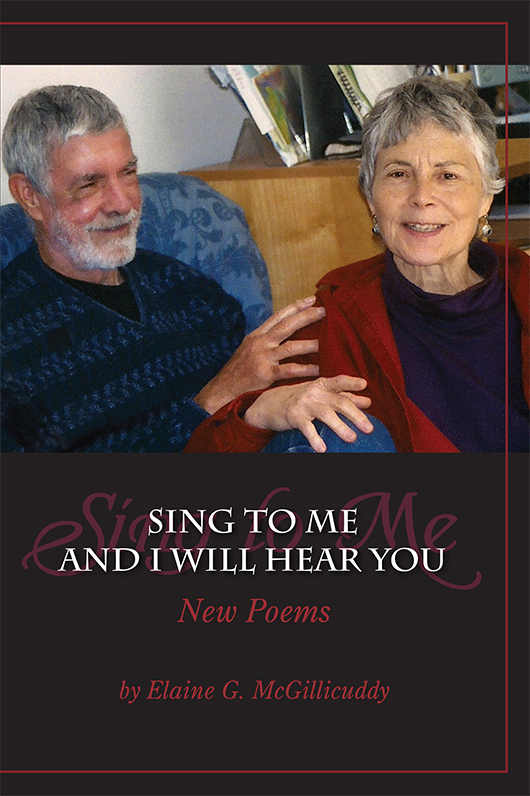 Reflecting over five years of the author’s experience as a widow, SING TO ME AND I WILL HEAR YOU – New Poems tracks her progression through the crucible of the death of her spouse. This second book of poems represents her transitions in four chapters: THE HELMSMAN STEERS, NEW IMPERATIVE, CURRENTS UNDERNEATH and RANGE OF GLORY’S REACH. A Friend Who Knows the Tone, my fourth book, is a book of poems I wrote for a handful of reasons. First, to thank my editor, Mike O’Connor. It is he who most directly assisted me in completing the three books I felt compelled to write after Francis, my late husband, died in 2010. Their main title was Francis’s request of me when he was dying: “Sing to Me and I Will Hear You.” Writing those two books of poetry and Sing to Me and I Will Hear You – A Love Story in prose, felt like the most important thing I was called to do – to tell Francis’ and my story, and in so doing – to leave our legacy of love. In addition to being an editor, however, Mike O’Connor is also a northwest poet, writer, and translator of Chinese literature. So I also wanted to spotlight for our time what I learned from him — the ancient tradition of chih-yin, a Chinese word meaning “to know the tone.” He had unearthed this while translating, for his book, When I Find You Again, It Will Be In Mountains; Selected Poems of Chia Tao. This also explains why, just as my own earlier poems sustained me, by camouflaging or postponing the full brunt of my grief – so did reading his works, for example, The Basin: Poems from a Chinese Province. These took some of my attention away from my barely bearable grief. In that sense, Mike helped me through that grief. It is not surprising, then, that my gratitude is unbounded. 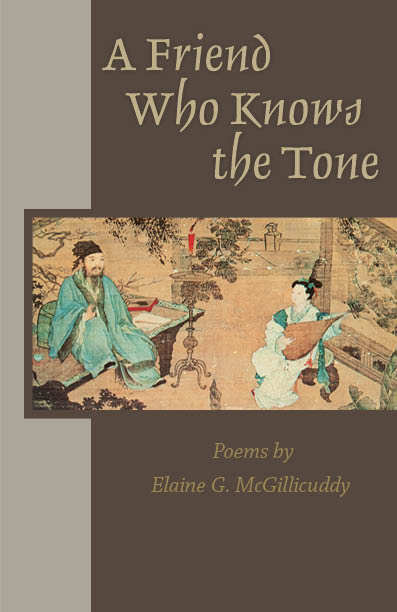 Written in the spirit of the chih-yin tradition, my thank you poems to him express my heartfelt, even loving, gratitude for his accompanying me as editor and chih-yin/friend. Francis, I am certain, would do no less. A sequel, because it goes further in revealing yet another way in which I survived the physical loss of my beloved spouse.